Whether the bell ringers for the Salvation Army, participation in Toys for Tots, or another program, the Christmas season brings awareness of community needs. It also reminds us of those in our communities who work to alleviate unmet social needs. Think of those who create new ways of meeting community needs as social entrepreneurs. My colleagues Bob Jolly and Peter Orazem conducted a survey of Iowa State University Alumni a few years ago to gather data on the entrepreneurial activity of that group. In a past post, I wrote that the survey showed that over 15 percent of 1982 to 2006 alumni had created at least one for-profit venture. The survey also asked respondents about their activities as social entrepreneurs. We recently published an overview of the results of the survey related to social entrepreneurship, which you can find here. Commercial entrepreneurship has received a great amount of attention because of its close relationship with economic development, and the definition of entrepreneurship in a for-profit, commercial context is understood. What exactly is meant by the term ‘social entrepreneurship’ is debated by academics, but the idea is that social entrepreneurs address social problems or needs that are unmet by private markets or government. Just as commercial entrepreneurs strive to change economic life, social entrepreneurs strive to change social life by identifying opportunities, inventing new approaches and creating solutions. An historically noteworthy person whose work is often cited as social entrepreneurship is Florence Nightingale (founder of the first nursing school, developer of modern nursing practices). A contemporary social entrepreneur is Muhammad Yunus, founder and manager of Grameen Bank and its growing family of social venture businesses, who was awarded a Nobel Peace Prize in 2006. There has been very little work done to describe a wide sample of social entrepreneurs. Our survey provides at least a view of one subset of the population as a whole, public university graduates. Our measurement of social entrepreneurship activity was to ask survey respondents whether they had started a non-profit organization (NPO). Certainly social entrepreneurship may be thought of in a broader context than just NPOs. However, the responses to this survey offer an interesting glimpse into the activity of those among us who create solutions to meet social and community needs. Almost 3 percent of ISU graduates between 1982 and 2006 had created at least one nonprofit organization. The chart below shows the results by College of graduation. The primary focus of the organizations founded by alumni social entrepreneurs was education and youth related causes, with services geared heavily toward local needs. This fits in with the profile of alumni social entrepreneurs, who were active in their communities. For example, social entrepreneurs have lived in their communities, on average, for 13 years, nearly 4 years longer than non-entrepreneurs. 83.9 percent of social entrepreneurs participated in an improvement project in their community during the previous year when the survey was conducted, compared to 57.7 percent of non-entrepreneurs. More than 97 percent of social entrepreneurs belong to at least one community organization and 66.6 percent belong to three or more organizations. 40.6 percent of social entrepreneurs state that they are very active in their communities, while only 8.2 percent of non-entrepreneurs report themselves as very active. In total 85.6 percent of social entrepreneurs report themselves as being active in their communities, 39 percent higher than non-entrepreneurs. What is the main focus of your nonprofit organization? The nonprofit organizations founded to meet these needs were typically small, with one or two paid employees and 5 to 15 volunteers. The bulk of financing for these organizations came from private donations (51.2 percent) and funds from the entrepreneur (30.0 percent). In addition to self-financing and private donations, 26.5 percent of NPOs received donations from foundations and 10.7 percent government grants. Only a small proportion of NPOs used loans from banks or gifts from family members. 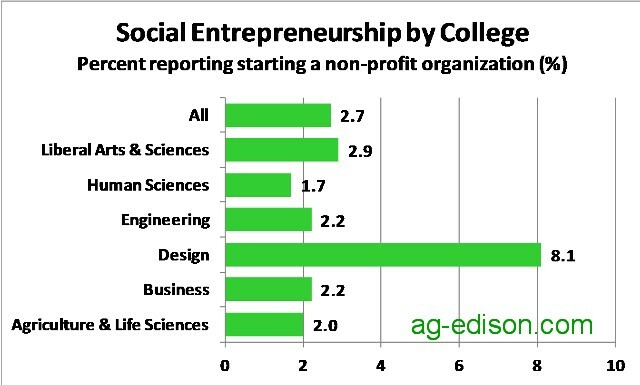 The survey also revealed entrepreneurial activity among the same alumni in creation of both commercial and nonprofit organizations. Among respondents, 40 percent of those who had started a nonprofit organization had also started a commercial organization. Entrepreneurial behavior can applied in many contexts, both commercial and social. The activity of social entrepreneurs is important because it is underpins the social and cultural fabric of communities. Social entrepreneurs create organizations that work to alleviate problems that may not be addressed, or addressed as directly or creatively, by commercial or governmental organizations. on your articles. I will bookmark your weblog and take a look at again right here regularly.